Republic of China (Taiwan) Resident Ambassador to St. Kitts and Nevis His Excellency Tom Lee on behalf of his government and people presents a cheque and keys to Hon Mark Brantley, Premier of Nevis. CHARLESTOWN, Nevis — The government and people of China (Taiwan) continue to be an excellent partner to the Federation, according to Hon. Mark Brantley, Premier of Nevis. The Premier thanked H.E. 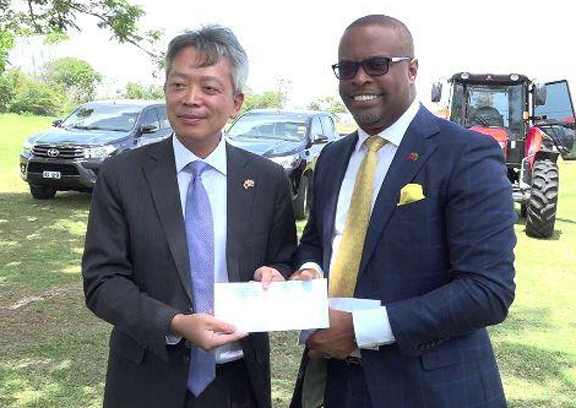 Tom Lee, Republic of China Resident Ambassador to St. Kitts and Nevis for their generous support and recent donation of more than EC $1.5 million in cash and kind. “His Excellency Lee made his maiden voyage to Nevis yesterday… He delivered two tractors, brand new; two pick-up trucks, brand new; a backhoe, brand new; and a vehicle for the Premier’s Office, brand new, all of which we have been told comes to a combined total of over EC $1.5 million. “In addition to that, he delivered a cheque for US$15,000 to purchase a walk-in freezer for the Ministry of Agriculture, to be placed at the Agro-processing Unit to assist the ongoing efforts at securing significant market for our mango pulp… They remain and continue to be an excellent partner for St. Kitts and Nevis,” he said. The Premier described the gift as the largest one to date from a foreign government to Nevis and underscored the gift’s significance. “I believe the hand-over was the most significant we have ever seen in the history of Nevis happening at one time, that a foreign government would have gifted to us over $1.5million in equipment and this equipment is going to be very valuable to the Ministry of Agriculture. “It’s going to assist us in clearing the lands, clearing various estates and certainly the tractors are going to be pressed into use. Indeed I believe they are already in use in ploughing lands and making lands available, as we continue our thrust to try and get more people involved in agriculture and try to feed ourselves and I think that that is important,” he said. Brantley added that the gift is not the end of the good news. He said he had received word that they had also agreed to assist the Nevis Island Administration with the public park at Pinney’s Estate in the area of Pinney’s Beach. A team is expected to visit the area sometime this week to formalize plans for the development of the park.